In case you missed it, I like photobooths! I’ve been collecting them for a long time– here’s another update on my latest favorite strips. I apologize for the image quality, though. My scanner is broken, so I’m attempting to use a camera instead. Anyways, this first set is great, so many fun things happening. I dig the couple in the first strip. He’s so squinty! They manage a kiss in the third panel, and move on to making goofy faces. Fun folks. I have a theory that the third panel is where the magic happens, btw. The first picture bewilders many people and the second sets their sense of timing, but unless they’re experienced photoboothers, they don’t get it down pat until the third panel. Plus, you’re over the hump– it’s time to do something crazy before it all ends. Check out the third panel of strip two: he’s hilarious! Even Mr. Creepy Woodsman catches the bug in the third panel; what a transition from panel two, where he looks like he’s trying to burn down the photobooth with his eyes. Clearly the last couple’s third panel magic broke the booth. I’d cheer, but who likes a broken photobooth? This is the “naughty” group. I’m not pointing any fingers, but the various shocked looks are a sure tell. What’s happening between frames?! This set is kind of a smorgasbord– a bit of tongue, some shocked looks, and a lone gang sign in the fourth panel of strip one. White tweens, represent! 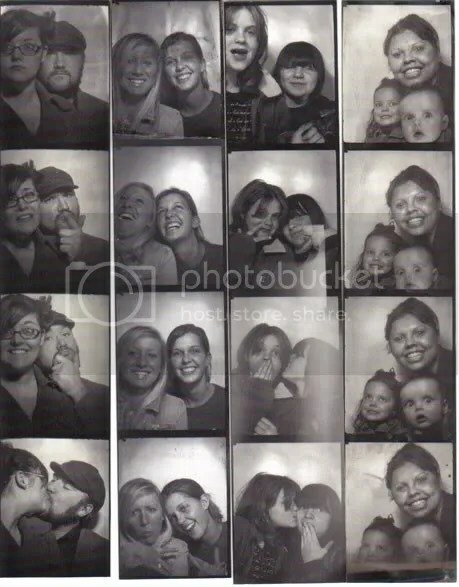 Here’s a sad photobooth topic– the missed/denied kiss. Sometimes, as in the third panel of strip two (or the first panel of column three) it’s a matter of timing. Check that middle strip out again… clearly, she’s feeling the third panel magic, but swoops in a bit too late for the evidence to become part of the permanent record. It’s hard to see in the third column, but take my word for it, this is total kiss miss. They look happy in the second panel, though, don’t they? Now let’s dig strip one– it’s so sad. He’s done his best to impress through three panels, but doesn’t work up the nerve to kiss her until the 4th. And then… well, her look says it all, don’t you agree? There’s no missed kisses here! Bonus points for third panel snuggling magic in column two, and a rarely seen “gospel album” pose in the last panel of strip three. There’s so good coordination going on in the first strip in this set, plus, the lighting is good. I believe this particular strip may even have been temporarily displayed on the booth itself. You’ll need to view it full to see, but check the lady’s face in strip two. It’s like the flashbulb woke her up or something! Strip three guards against too bright flash with Top Gun shades. The girls in the third strip crack me up. They’re having a good time, but not nearly as enthusiastic as the lady in panel one of the last strip. “OMG! I’m in a photobooth!” Her life’s dream, realized. This is our “modern art” section of the photostrip update. Young master Bill thumbs his nose at fate in strip one, mocking the ravages of nature as pictured in the middle panels. Is the woman in the final strip accepting, or unaware, of the danger nearby? Babies! It’s always the same. You spend two bucks, and these ungrateful drool-buckets won’t look at the camera. LOL Check out the baby’s happy smile in panel two of the last strip. Our final three sets are further examples of abstraction in photobooth photography. It’s too bad about these– the two bald ladies in strip five look like they’re having a good time (might this be a cancer survivor and a friend shaved in solidarity?) and the guy’s smile in the last panel of strip seven is fantastic. Plus, he’s with his baby boy, who looks pretty cute. I hope they ended up taking lots of other photos together! Finally, dig the ninth strip, for the lady in the checkered outfit. Is that some third panel magic happening for her? Hard to see, but I think the smile tells in the last panel! If you want to see more of my photobooth collection, go here, and here, and here. Here’s something to make your Xmas weird– download a ten year-old girl’s Casio SK-1 experiments! Style City’s “The Happening” EP features extended minimal drones, surprisingly morbid lyrics, and an ode to giant robots! Highly recommended for fans of The Shaggs, Chica X, and Eyes Like Saucers. Also available in a limited edition of 10. Trades only! Send e-mail to stylecitymusik AT myspace.com for details. Visit Style City on the web. More music you don’t want! I didn’t hear anyone clamoring for me to upload the last three broadcasts of “It’s Too Damn Early,” but I’ve put them up for free download anyhow. Either you all stayed up to hear it live, or your passion for new experience is as dead as beef. 3/15/08: The “Golly, DaveX sure likes them organs” broadcast. The links above connect straight to their respective download. Playlists can be found in the original liveblogged entries here, there, and everywhere. Who wants a nice book? That being said, I’ll admit that I don’t much like keeping books around. They’re heavy, they take up space, and I rarely read anything more than once. On the other hand, I read a lot… so new books have to arrive at least as often as old books depart. That’s why I’m giving away one of my books– it’s my blatantly cheap method of getting something new to read all while avoiding crowds of people at a bookstore. 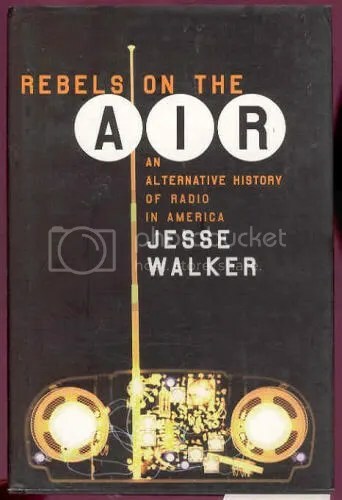 So here’s what I’ve got: “Rebels on the Air: An Alternative History of Radio in America,” by Jesse Walker. The book is about 300 pages, hardback, and quite interesting. It’s in very nice condition. Obviously, it deals mostly with American radio history, but also has a good amount of information about foreign radio activities. For anyone interested in pirate broadcasters, micro-radio, the FCC, freeform programming, or just wanting to get up-to-speed on radio’s “backstory,” this is a good read. The deal is that I want to trade this book for another equally interesting book. Leave a comment with your offer, or send an e-mail– I’ll choose someone to trade with in the next 10 days. If things get hot and literary, we may work out a three-way trade. 1) Anything with elves, dragons, or chaotic half-dwarf mage healers. 2) Anything that is part of a series, or set in its own “universe”. 3) Anything with “8 pages of COLOR photos!” in the middle. 5) Anything that changed your life, and made you buy 25 copies that you now give away to complete strangers. Now go! Search your bookshelves and return to my comments section! Fly! Fly! Today I’ve finally started working on what music I want to put in my jukebox. With the sheer volume of music I have laying around, plus all the random tunes floating around in my head that I do not yet own, it’s been a hell of a task. 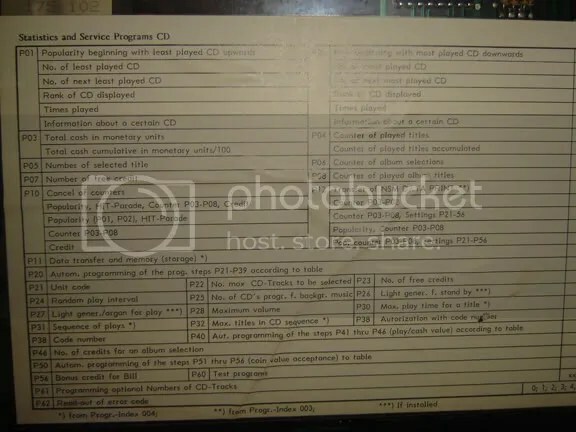 So far, I’ve only gone through one of my dressers I use for CD storage; leaving around eight zipper albums of discs, a bookshelf of stacked CDs, another dresser of discs, and who knows how many spindles worth of CDRs. For now, I’ve decided to ignore my vinyl and tapes– the last thing I want is to spend hours recording records and tapes into my computer, yuck! Nevertheless, the process has been extremely interesting to me. As with any presentation format, the jukebox has its own unique qualities that I’ve been discovering along the way. First off my family and I will be the primary audience, so in that regard, it’s something like an iPod. On the other hand, I’ve settled the jukebox in my kitchen, and it’s over 300 pounds… so it’s not nearly as mobile. That means anytime I’m listening, I’ll most likely be in the kitchen– similar to how an ordinary stereo system stays in one spot. Of course, it’s not a stereo system. 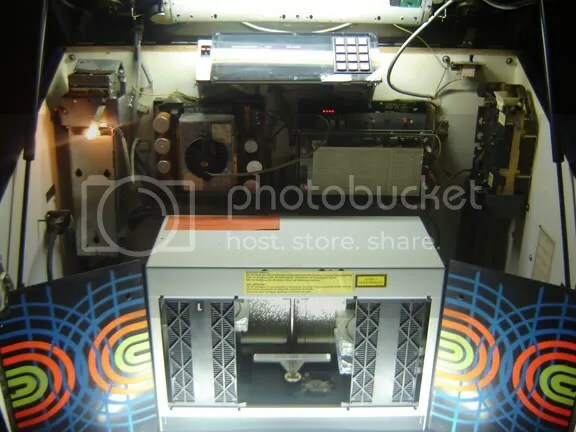 Unlike a normal stereo, the jukebox is only designed to play one track at a time. Up to 99 tracks can be queued, but must be entered individually. Because of this, no benefit is bestowed upon albums in the way they are played in a typical stereo, where a listener might just let an album play on through the intended track. The jukebox is quite cold in this regard– only the individual tracks matter. With 100 spaces for discs, I’ve found remarkably few discs I want to add in total– somewhere under 25, I believe. For the remaining 75 slots, I plan to burn compilation CDRs of individual tracks. To this end, I spent much of today going through my CDs one by one, ruthlessly culling tracks from albums. What surprises me are how few of my favorite albums actually made the cut– Patti Smith’s “Horses” is absent, as is “OK Computer”, “Sang Phat Editor”… no Crass albums, no Nirvana, no Jimi Hendrix. To be sure, tracks from all of these will appear in the compilations; but used as a whole in the jukebox, they just don’t work. Let’s face it, nobody wants to walk over and punch in 32 different numbers to queue up “Horses,” and on Jimi’s concept-type albums like “Electric Ladyland,” the experience of listening straight through just doesn’t work well on the juke. Instead, I feel gently encouraged to find the stand-alone tracks and save the rest for my normal stereo. Jukeboxes are from another time, long before the so-called “album” was ever thought up. 78’s (and eventually 45’s) were best-suited for an era of doo-wop, blues sides, dance numbers, rock singles, and pop music… and that’s got to be what jukeboxes handle best as well. In a way, it makes my machine seem like some sort of unwieldly, impossible monster– saddled with the body of the compact disc, but the heart of a 45 record. As I’ve mentioned previously, I’m a big fan of photobooths and the photostrips made within them. I don’t mean those new digital things, just the old “dip and dunk” type. Earlier this year, I scanned a large portion of my personal photostrip collection, including the ubiquitous shots of the photobooth owner taken during maintenance. Since that time, I’ve been trying to catch him somewhere to let him know that there are dozens of scans of him online, as it seems the polite thing to do. I urge you to put this policy in effect as well– if you have dozens of photos of me somewhere online, please let me know, haha. Anyhow, I saw him a few days back, and told him about the scans. He took it much better than I might have, and promised to hook me up with a large amount of photostrips he’d amassed over the last few years. I agreed that I would only keep the damaged and owner photos, but will return the others– so if you see your photo here, there’s a good chance you can still rescue it! I hope to get the owner photos scanned within the next 12 hours, so be sure to come back and check them out as well! Alrighty, let’s start on the photos– lots of kissing going on. The best of this set of four is the little girl in the 4th strip. Check that grin! Also, the mom barely moves, even as the baby become increasingly more crazed.